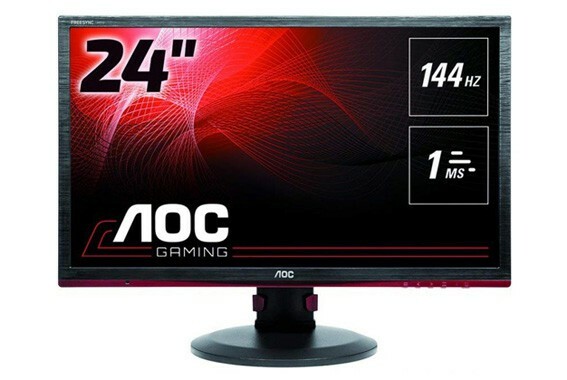 AOC G2460PF Review 2019 - Why This Gaming Monitor Kinda Rocks! TN panels are immensely popular, and there’s a reason for that. Not only are they relatively inexpensive to manufacture, making them the prime choice for the more affordable low-end monitors, but they are also the fastest. As such, it is no wonder that there are so many TN gaming monitors out that manage to find a great balance between pricing and performance. 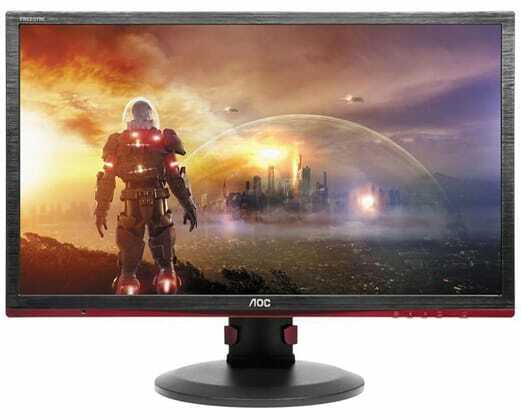 The AOC G2460PF is one such monitor. 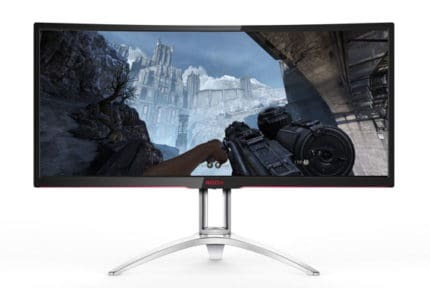 Though it may (arguably) not be the best-looking monitor, many a performance-oriented gamer who wants to add a 144 Hz monitor to their setup without spending too much will find this one highly appealing. The G2460PF is a gaming monitor, and it’s not shy about it. One glance at it, and the red highlights and the brushed metal texture of the bezels confirm it. Usually, this is the kind of design that you either love or hate – some like attention-grabbing details and aggressive highlights in their gaming products while others prefer something more minimalistic and less conspicuous. As for the stand, it has a simple circular base and is fully adjustable for height, tilt, swivel, and pivot. Naturally, it is a VESA stand, and the monitor is compatible with any 100×100 VESA stand or mount. As such, if you ever need to replace the stand or mount the monitor on a wall, it won’t be a problem. As already mentioned in the introduction, the G2460PF uses a TN panel. And as is the case with most TN panels in this price range, we’re talking about a 144 Hz refresh rate and a 1ms response time, a combination which allows the kind of responsiveness and fluidity that you just can’t get with a regular 60 Hz monitor. However, TN panels are far from perfect and they usually have two very significant drawbacks: limited color accuracy and poor viewing angles. So, how does the G2460PF fare in this regard? Well, as far as the colors are concerned, this monitor handles color accuracy a bit better than your average TN monitor, though it may need a bit of calibration. But needless to say, it can’t come close to what most IPS and VA monitors can offer in this regard. As for the viewing angles, they are, unfortunately, as narrow as you’d expect, though this isn’t much of an issue since the monitor is easily adjustable. Other than that, the monitor has good contrast and is quite bright, reaching a maximum brightness of about 350 nits. However, there is some noticeable backlight bleed which is especially noticeable in the dark and the contrast could be better. In any case, it goes without saying that the G2460PF is definitely a monitor that is intended for gaming above all else. It will offer a highly responsive gaming experience, but this will come at the cost of viewing angles and, more importantly, the visuals. Granted, you can always have your cake and eat it, too, by investing in an IPS or VA monitor with a high refresh rate, but if you’re on a budget, you will need to pick between performance and visuals. 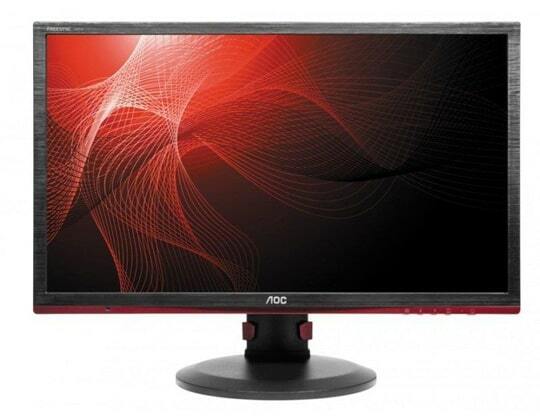 Just like any monitor with a high refresh rate, the G2460PF has adaptive sync i.e. 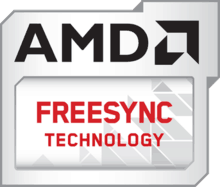 AMD FreeSync. Now, FreeSync can have some issues when it comes to some cheaper monitors, but that’s not the case with this one. Namely, FreeSync works in the 35-144 Hz range with DisplayPort and in the 35-120 Hz range with HDMI, and we can hardly ask for more. Now, it should also be noted that Nvidia has recently enabled FreeSync on their GPUs. Sadly, the G2460PF is not officially supported, so there is no guarantee that it will work properly with an Nvidia GPU. As such, if you have an Nvidia GPU, you may want to turn to a G-Sync monitor, even though it may be a bit more expensive. The AOC G2460PF also comes with stereo speakers, each with an RMS of 2W, which is essentially the standard when it comes to monitor speakers. However, like most monitor speakers, they just aren’t that great. Of course, they are a convenient feature to have, but since they sound very flat with little punch to the sound, you will definitely need dedicated speakers if you actually want proper speakers. 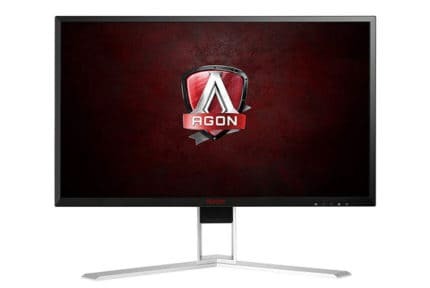 So, all in all, is the AOC G2460PF a good monitor? Well, it all depends on what you expect from it. 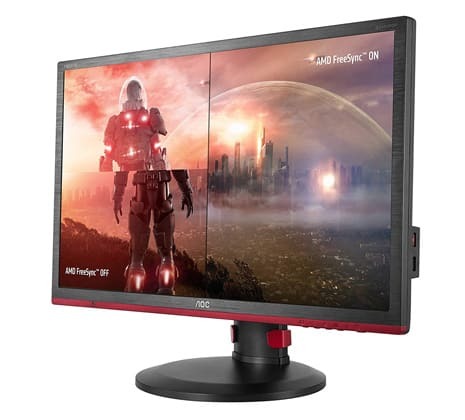 It being a 144 Hz TN monitor priced at about $200, it should be fairly obvious as to which type of customer it is geared towards: gamers who want the best performance that they can get without putting too much money towards a premium gaming monitor. That said, the G2460PF is highly responsive and offers the kind of fluidity that you just can’t get with a regular 60 Hz monitor or TV. 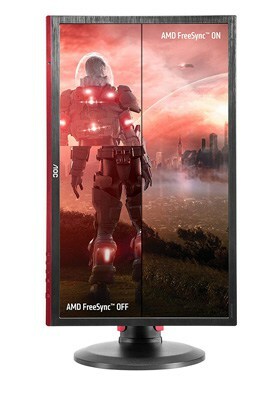 Furthermore, the FreeSync is implemented very well and works in a wide FPS range. Combine that with the 1ms response time, and there really is nothing to complain about on the performance front. But of course, as mentioned already, the AOC G2460PF comes with the same technological limitations that plague every TN panel: narrow viewing angles and color reproduction that really cannot compete with an IPS or VA monitor in the same price range, both when it comes to colors and the contrast. As such, if you cannot afford a more expensive monitor that would allow you to have your cake and eat it, too, then you’d have to choose between visuals and performance. If you’re willing to sacrifice color accuracy for a high framerate, then you will definitely find nothing to complain about with this monitor. Apart from that, we have no major issues with the AOC G2460PF. The design may be too much for some people and we’re not big fans of this approach, but that is a subjective matter. 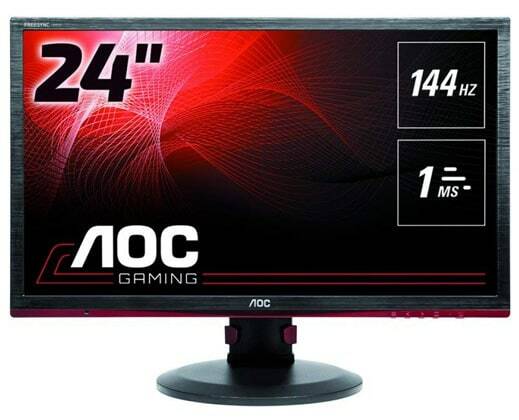 All in all, the AOC G2460PF is pretty much the epitome of a proper performance-oriented budget gaming monitor, boasting not only a fast and responsive TN panel but also very well-implemented FreeSync, complete with a fully adjustable stand. On top of that, it even handles colors reasonably well, though it cannot compete with IPS or VA monitors when it comes to the visuals.